WASHINGTON (CNN) -- Preliminary results of a joint U.S.-Afghan investigation show U.S. airstrikes in western Afghanistan this week killed Afghan civilians, a senior U.S. military official told CNN. 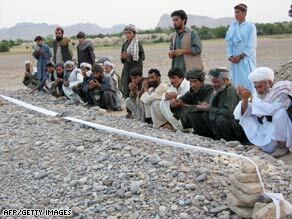 Villagers pray at a mass grave this week after an airstrike in Afghanistan's Farah Province. The investigation into the air strikes Tuesday in Farah Province found an unknown number of Afghan men, women and children were killed when U.S. warplanes bombed more than half a dozen targets, the senior official said. The official, who had knowledge of the investigation details, declined to be identified in advance of a news conference scheduled in Kabul, Afghanistan, on Friday to discuss the findings. The official said the targets bombed were buildings and compounds that the U.S. military had identified as areas from which insurgent fighters were firing on Afghan and coalition forces. But based on evidence collected by military investigators, there also were civilians at those locations, the official said. The U.S. military believes the insurgents were holding people there as a means of causing civilian casualties, the official said. The United States may never get a confirmed number of civilian dead because of the Islamic practice of quick burial. But since the airstrike, Afghan officials said dozens of civilians were killed. "This is not looking good," the official said, noting repeated instances of civilian casualties are becoming increasingly sensitive politically for the government of Afghan President Hamid Karzai. The question now for investigators, the official said, is how much information was available at the time of the strikes about the potential presence of civilians and whether those in charge should have known civilians might be in the vicinity. In the past, the U.S. military paid compensation to victims' families and leveled heavy public criticism against the Taliban for holding civilians at risk in conflict zones. The senior U.S. military official also said the United States is still looking at separate intelligence that some civilians in a nearby area were killed with hand grenades by militants who then displayed the bodies, claiming they were killed by U.S. bombs. The official said that intelligence is still believed to be reliable, but investigators may never be able to confirm it because of lack of access to bodies already buried. There also is some information, U.S. officials say, that some civilians were beheaded by insurgents in the area during the several hours of heavy fighting. Defense Secretary Robert Gates, traveling in Afghanistan on Thursday, would not comment on the report of the grenade killings until a final report is released, but he expressed regret over the deaths. "We regret any, even one, Afghan ... innocent civilian casualty. And we will make whatever amends are necessary," Gates said. "We all know that the Taliban use civilian casualties and sometimes create them to create problems for ... the United States and our coalition partners. We will have to wait and see what happened in this particular case." The International Committee of the Red Cross said in a news release earlier this week that its "impression was that dozens of people, including women and children, had been killed" in the airstrikes. "The ICRC workers were told that some of the dead had already been buried by the time they arrived on the scene," it said. The Red Cross added, "We know that those killed included an Afghan Red Crescent volunteer and 13 members of his family who had been sheltering from fighting in a house that was bombed in an airstrike." "We reiterate our concern that far too many civilians in Afghanistan are killed in incidents such as airstrikes and suicide bombings," Stocker said. "We will now try to learn as much as we can about exactly what happened and then raise our concerns in bilateral dialogue with the parties to the conflict."